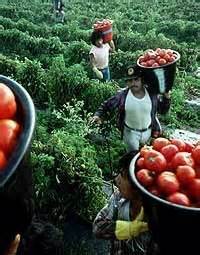 Food Chains opens at the break of dawn, as tomato pickers in Immokalee, Florida, hustle onto buses and out to the fields where they spend long hours trying to pick enough fruit to survive. Late in the evening they return to cramped trailers, with barely enough wages to purchase groceries for a family meal. Though Florida's rich soil generates hundreds of millions of dollars worth of tomatoes, those harvesting them make around $12,000 a year. And the worst part, as tomato picker Gerardo Reyes Chavez points out, at the end of the day there's only the realization of "how little you mean to the people you are working for." "We're not poor in this country�we're screwed," remarks farm advocate Lucas Benitez in Food Chains, an illuminating documentary about ag workers that hits theaters today. Directed by Sanjay Rawal (Ocean Monk), the film sheds light on how our produce depends on the labor of workers who are paid by the piece and are twice as likely to live beneath the poverty line as salaried employees. It sounds like a film worth watching. The article actually describes a success story in improving the lives of workers. But that work isn't finished yet. Thanks, Dee. It is Brutally hard work. Noted. Excellent article! Thanks for sharing, Dee.